For all your auto repair needs, contact Luke’s Auto Repair LLC of Onalaska, Wisconsin. 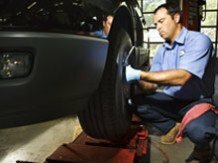 Serving Onalaska, La Crosse, Holmen, West Salem, Trempealeau, Sparta and Tomah, our auto shop employs a team of ASE Master certified technicians. Our Saturn and GM certified mechanics accept repair work for all makes and models. We do all types of car maintenance and repair work, including tires, starters, batteries and alternators. Walk-in customers are welcome.